The single week, March 18th to 25th was weird because long-term rates fell so far so fast, and so quickly after the huge drop November to December. Now it’s weirder because rates have stayed down. No rebound upward, no “retracement.” Market theory says that big moves in either direction should retrace by one-third, and begin quickly after the drop. “Big”? “Huge”? The 10-year T-note on November 7th was 3.23% (add 1.9% to get 30-fixed, no-point mortgage rates). By the end of December, 2.70% — and stayed there without rebound until three weeks ago, and then ker-plunked to 2.40%. Most of one percentage point is a lot, but we don’t often see bond yields drop by one-third. And stay put. “Why” is worth asking. The Fed has not cut the cost of money, still in a band “2.25%-2.50%.” Reliable sources, Kaplan at the Dallas Fed said directly this week that expectations of a cut are ahead of the game. Traders of the 2-year T-note, always the best Fed-predictor beg to disagree, the 2-year at one point this week under 2.20% and priced for a cut by fall. But 10s have fallen so far that there is no spread to 2s — 10s forecast two or three .25% cuts. Another voice disagreed with Kaplan. Powell is struggling as a public performer, and Janet Yellen is behaving as shadow chair. If she had been reappointed, the Fed might not have been so aggressive last year. The prior Fed chair essentially never speaks directly of policy during the term of the successor, but Yellen again, this time this week from Hong Kong: the U.S. Treasury yield curve may signal the need to cut interest rates at some point, but it does not signal a recession. More about the curve below. Economic data are still garbled by the shutdown and delayed releases, as well as the December stock market air pocket and damage from 5%-plus mortgages. 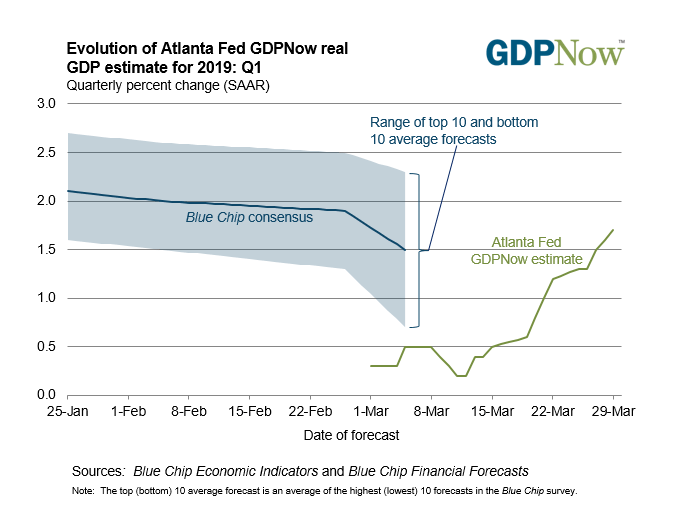 However, the economy has modestly slowed: 4th quarter 2018 GDP revised down to 2.2% annualized, and the 1st quarter 2019 will be fortunate to top 2%. Personal income in January fell 0.1%, to be expected during shutdown, but February had no big, offsetting bounce, up only 0.2%. Most important for the Fed, January inflation slid down to 0.1% (personal consumption expenditure deflator, “core PCE”), half of target and not likely affected by shutdown. But there is no recession picture. The whole raft of housing data this week — pending sales, sales of existing and new homes, permits and starts — all just wandering along without change. Of all domestic data, only the shortfall in inflation suggests Fed ease. 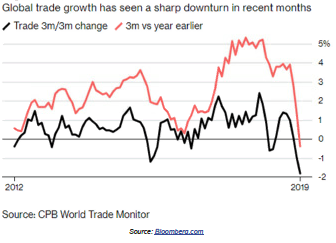 The fingerprints of this two-step drop in long rates are from overseas, China-Europe-Japan, and the sharp drop in global trade. Maybe tariffs, maybe not, maybe just China in trouble. The telltale German 10-year has fallen farther below zero, now minus-0.069%. Our 10s look fat to the world. Secondarily, the rate drop itself shows signs of causing damage to funds and firms who were on the wrong side. The most bizarre aspect of any drop like this: forcing wrong-siders to buy to re-balance with liabilities and hedges. This week’s stay-put is a sign that some big money is still caught in that irrational buying, holding rates down. Of course rates could go lower, but for consumers buying now, odds heavily favor taking the bird in hand. 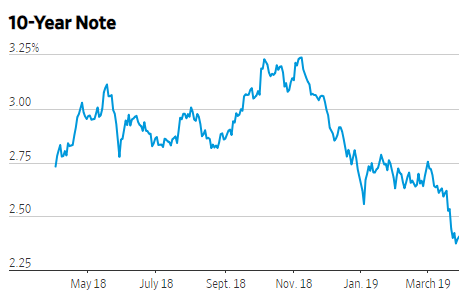 But consumers and everyone sensitive to financial news has been carpet-bombed by “yield curve inversion” all over the web and even reliable media. There’s just enough predictive truth in the inversion pattern to make people nervous — enough to pull back from risk and make the bombardment a self-fulfilling prophecy of steep slowdown. Fight off all of that until there is supporting evidence. Yield curves are effect, not cause. The Fed is causation, pushing up short-term rates. In the early stages long-term rates go up, too, but at a certain altitude the demand fades for long-term loans and long-term rates stop rising. And at about that moment long-term bonds look like good deals, and buying puts a top on long-term rates. However, to be a forecast of recession, a flat or inverted curve must indicate that the Fed has hiked enough to cause distress. Trouble among floating-rate borrowers, rising delinquency — and we have none of that. Inversion should signal a Fed-induced credit crunch — that’s why we say that a rate hike is “tightening,” and we don’t have that, either. There is no evident shortage of credit. 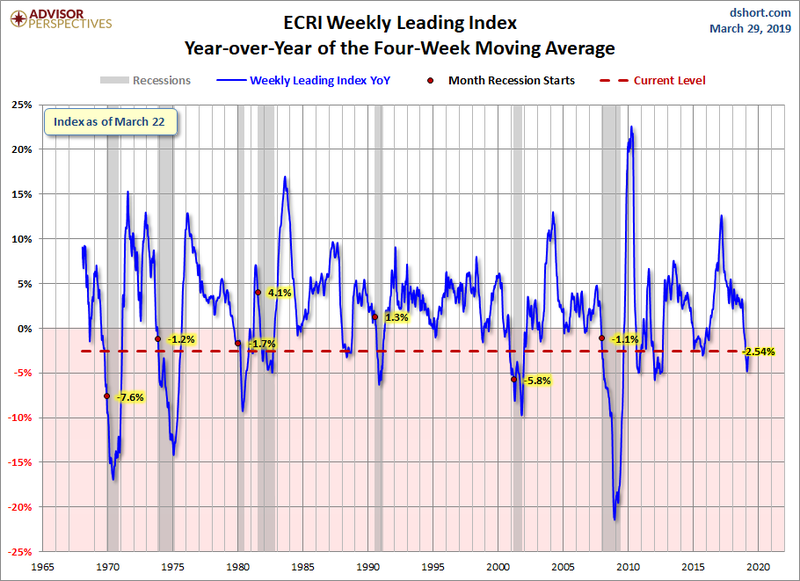 Most important in this economic cycle, we have not had a credit cycle in which credit has gotten easier and a good economy has emboldened bad risk-taking among borrowers and lenders alike. Borrowers today are the most resilient ever, so late in an expansion. Next week: all bets off until March employment figures next Friday.